Received October 25, 2017; Revised November 9, 2017; Accepted November 10, 2017.; Published online January 23, 2018. The cytoplasm in mammalian cells is a battlefield between the host and invading microbes. Both the living organisms have evolved unique strategies for their survival. The host utilizes a specialized autophagy system, xenophagy, for the clearance of invading pathogens, whereas bacteria secrete proteins to defend and escape from the host xenophagy. Several molecules have been identified and their structural investigation has enabled the comprehension of these mechanisms at the molecular level. In this review, we focus on one example of host autophagy and the other of bacterial defense: the autophagy receptor, NDP52, in conjunction with the sugar receptor, galectin-8, plays a critical role in targeting the autophagy machinery against Salmonella; and the cysteine protease, RavZ secreted by Legionella pneumophila cleaves the LC3-PE on the phagophore membrane. The structure-function relationships of these two examples and the directions of future research will be discussed. 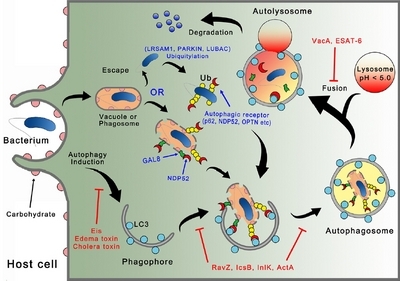 Autophagy is an evolutionarily conserved cellular pathway that delivers cytoplasmic proteins and organelles to the lysosome for degradation in eukaryotic cells (Huang and Klionsky, 2007; Levine and Klionsky, 2017; Nah et al., 2015; Nakatogawa et al., 2009; Wen and Klionsky, 2016). In contrast to the ubiquitin-proteasome system, autophagy can degrade the comparatively large substrates, including protein aggregates, cellular organelles, and invading pathogens (Levine et al., 2011; Mizushima, 2011). Initially, autophagy was thought to be a nonselective pathway for the degradation of cytoplasmic components to provide energy and aid survival in nutrient-deprived conditions (Mizushima et al., 1998). However, many recent studies of selective autophagy have been reported (Boyle and Randow, 2013; Farre and Subramani, 2016; Kim et al., 2013; 2015; 2016; Kim and Song, 2015; Kwon et al., 2017b; Liu and Du, 2015; Svenning and Johansen, 2013; Zaffagnini and Martens, 2016). Selective autophagy requires specific autophagy receptors and is referred to by different terms based on the cargo molecules: aggrephagy (protein aggregates), lysophagy (lysosomes), mitophagy (mitochondria), pexophagy (peroxisomes), and xenophagy (invading pathogens). The substrates for selective autophagy are recognized either directly or indirectly by phagophores. In mitophagy, phagophore-conjugated LC3-family proteins directly recognize the mitochondrial proteins NIX, BNIP3, and FUNDC1 (Liu et al., 2014). In contrast, other selective autophagy receptors, such as p62/SQSTM1, NDP52 (also known as CALCOCO2), and optineurin (OPTN), simultaneously recognize membrane-conjugated LC3-family proteins and autophagy substrates (Boyle and Randow, 2013). As indicated, the autophagic process utilized for the degradation of bacteria or viruses is termed ‘xenophagy’ (Levine, 2005). Infectious bacteria are cleared from human cells by host autophagy in combination with other upstream cellular components, such as autophagy receptors, ubiquitin (Ub), diacylglycerol, NOD proteins, galectin-8 (GAL8), and Ub E3-ligases (Sorbara and Girardin, 2015). Furthermore, LC3-associated phagocytosis has also been known as a novel form of non-canonical autophagy where LC3 is conjugated to single membrane phagosomes using a portion of the canonical autophagic molecules (Heckmann et al., 2017). However, as a survival mechanism, many bacteria have also evolved the ability to manipulate the host autophagy pathway through the inhibition of the function of autophagic molecules. Therefore, our cellular environment is essentially a battlefield with microbes and protein molecules are the armor and weapons (Fig. 1). In this review, we discuss the interplay between bacteria and host autophagy from a structural biology perspective, including how the autophagic process targets bacteria for clearance and how bacteria block this process for survival. There are many different types of molecules involved in xenophagy. Among them, autophagy receptors (also called cargo receptors or autophagy adaptors) are particularly important for selective autophagy (Kim et al., 2016; Svenning and Johansen, 2013; Zaffagnini and Martens, 2016). Autophagy receptors commonly possess LIR (LC3-Interacting Region) and Ub-interacting domains (UBA, UBZ, and ZnF), which suggests that ubiquitylation and autophagy are closely linked (Ji and Kwon, 2017; Kim et al., 2016; Rahighi and Dikic, 2012). When bacteria invade mammalian cells, they are usually restricted within vacuoles; however, some of this bacterial population can escape from the vacuoles and enter the cytoplasm, and the vacuoles themselves can be ruptured by the bacterial growth (Fig. 1). The autophagic proteins of the host target the bacteria through multiple steps. Bacteria are marked as degradation targets by the attachment of Ub molecules in cells (Levine et al., 2011; Thurston et al., 2009). Therefore, it is natural that autophagy receptors bridge ubiquitylated cargos, such as Ub-coated bacteria, to the autophagy pathway by using their LIR motif and Ub-binding domains. Although this phenomenon was discovered some time ago (Perrin et al., 2004), the molecular mechanism involved remains unclear. The E3-ligase that attaches Ub to bacteria has only recently been reported (Celli, 2012; Huett et al., 2012). Through the genome-wide analysis of leucine-rich repeat (LRR)-containing proteins, LRSAM1 (leucine-rich repeat and sterile alpha motif containing protein 1) was identified as a component of the antibacterial autophagic response (Ng and Xavier, 2011; Ng et al., 2011), and later, LRSAM1 was identified as the E3 ligase responsible for bacteria-associated ubiquitylation prior to autophagy (Huett et al., 2012). The LRR domain in LRSAM1 has been shown to be critical for bacterial targeting, whereas the C-terminal RING domain is important for the ubiquitylation of invading pathogens (Huett et al., 2012). Furthermore, LRSAM1 also binds the autophagy receptor NDP52, which subsequently binds the Ub chains and autophagic LC3 protein via UBZ and LIR, respectively. Interestingly, the ubiquitylation of Mycobacterium tuberculosis by Parkin, a well-known E3 Ub-ligase involved in mitophagy, has been also reported, which implied the existence of a functional link between mitophagy and xenophagy (Manzanillo et al., 2013). Very recently, it was reported that the E3-ligase LUBAC (Linear Ub Chain Assembly Complex) generated M1-linked linear poly-Ub patches in the bacteria, which serve as antibacterial and pro-inflammatory signaling platforms (Noad et al., 2017). This showed the coordination of two different defense pathways: xenophagy and NF-kB signaling. Ubiquitylation is an early step of xenophagy (Fig. 1); once bacteria are captured in an autophagosome, the subsequent steps are essentially the same as those enacted in the regular autophagy process. As noted, the Ub-binding domain of autophagy receptors is particularly important in the recognition of Ub-coated bacteria. At present, at least five selective autophagy receptors have been well-studied (p62/SQSTM1, NBR1, NDP52, OPTN, and TAX1BP1). 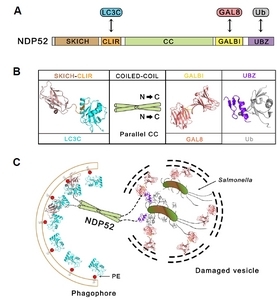 These autophagy receptors have hetero- or homo-oligomerization domains (p62 and NBR1: PB1 domain; NDP52, OPTN, and TAX1BP1: coiled-coil (CC) domain), which maximize the effect of cargo recognition or strongly interact with phagophore membranes (Behrends and Fulda, 2012). Further, receptor-specific domains allow the proteins to participate in diverse cellular signaling. In particular, NDP52 participates in xenophagic processes related to infectious pathogens, including Salmonella enterica serovar Typhimurium (hereafter, S. typhimurium), Listeria monocytogenes, Mycobacterium tuberculosis, and Shigella. NDP52 consists of a SKICH domain, LIR motif, CC domain, GALBI (galectin-8 binding) region, and UBZ domain (Fig. 2A). The unique GALBI region plays a critical role in the interaction with sugar receptor, GAL8, to clear invading Salmonella (Thurston et al., 2012). Carbohydrates located on mammalian cell surfaces are not exposed to the cytoplasm. Therefore, it has been proposed that these carbohydrates may represent a type of danger signal that is recognized by the danger receptors in the cells (Fig. 1). Randow and colleagues identified several sugar receptors, the galectins, that recognize the carbohydrates when they are exposed through the rupture of Salmonella-containing vacuoles (SCV); in particular, GAL8 binds to the carbohydrates and specifically recruits the autophagy receptor (Thurston et al., 2012). GAL8 belongs to the class of galectins composed of tandem-repeat carbohydrate-recognition domains (CRDs). Both N- and C-terminal CRDs (N-CRD and C-CRD) bind to carbohydrates with different specificities; interestingly, only C-CRD binds to the GALBI region (residues 372–380) of NDP52. Previous structural studies have elucidated the atomic details of how these two receptors interact with each other (Kim et al., 2013; Li et al., 2013). Although the full-length structure of NDP52 remains unknown, the structures of each domain in complex with the interacting molecules, LC3C, GAL8, and Ub, have been determined (Fig. 2B), except for the central homodimeric CC domain. There are two possibilities for the orientation of CC, parallel and antiparallel, and ACCORD, an assessment tool to determine the orientation of CC has been applied and the NDP52 was determined to have a parallel CC (Kim et al., 2017). The combination of all structural information has allowed a working model for the Salmonella targeting to phagophores to be constructed (Fig. 2C). Although some bacteria are targeted and eliminated by xenophagy, other bacteria have evolved mechanisms to counter or avoid this host defense system. Different bacterial species utilize their unique mechanisms to escape host autophagy, although the autophagosome in host can encapsulate many different intracellular bacteria through the xenophagic process. Therefore, diverse molecules from different bacteria are involved in this blockage of autophagy and these molecules are usually not conserved in the bacterial kingdom. However, they are classified into two main mechanisms: autophagy disarming and camouflage (Sorbara and Girardin, 2015). Certain bacteria can inhibit autophagy induction signaling upstream of the autophagosome maturation (Shin et al., 2010; Tattoli et al., 2012), evade autophagy recognition by masking the bacterial surface (Ogawa et al., 2005), interfere with the formation of the autophagosome (Choy et al., 2012; Kwon et al., 2017b), and hijack autophagy for bacterial replication (Sorbara and Girardin, 2015) (Fig. 1). Bacteria secrete their own factors for the modulation of host systems: Eis, anthrax toxin edema factor, and cholera toxin to inhibit the induction of autophagy; IcsB, ActA, and InlK to block the recognition of bacteria by the host autophagy system; RavZ and VirA to directly inhibit the autophagy components; and ESAT-6 and VacA to block the fusion step between the autophagosome and the lysosome (Huang and Brumell, 2014). Functional and structural studies of these molecules are currently in progress to enable the comprehension of their survival mechanisms and the subsequent development of novel antibiotics. Their structures have been reported as follows: Eis from Mycobacterium tuberculosis (Chen et al., 2011; Kim et al., 2012; 2014), edema factor toxin from Bacillus anthracis (Santelli et al., 2004; Shen et al., 2004), cholera toxin from Vibrio cholerae (Fan et al., 2004; Holmner et al., 2004; Merritt et al., 1994; Zhang et al., 1995), InlK from Listeria monocytogenes (Neves et al., 2013), RavZ from Legionella pneumophila (Horenkamp et al., 2015; Kwon et al., 2017a; 2017b; Yang et al., 2017), VirA from Shigella flexneri (Davis et al., 2008; Germane et al., 2008), ESAT-6 from Mycobacterium tuberculosis (Renshaw et al., 2005), and VacA from Helicobacter pylori (Gangwer et al., 2007). Recently, we and other research groups determined the structures of RavZ from Legionella pneumophila (Horenkamp et al., 2015; Kwon et al., 2017a; 2017b; Yang et al., 2017) (Fig. 3A) and independently proposed its mode of action; however, the mechanism for LC3 deconjugation is controversial. Therefore, the current perspectives on RavZ molecule will be included in this review. LC3B was originally identified as microtubule-associated proteins 1A/1B light chain 3B encoded by the MAP1LC3B gene (He et al., 2003). It possesses a shared folding pattern with Ub, and the phosphatidylethanolamine (PE) conjugation to LC3 is catalyzed by sequential steps of the autophagic E1-, E2-, and E3-enzymes, which is quite similar to ubiquitylation (Hong et al., 2011; 2012; Klionsky and Schulman, 2014; Maruyama and Noda, 2018; Mizushima et al., 1998). PE-conjugated LC3 is the most widely used marker of autophagosomes and plays a central role in the autophagy pathway (Klionsky et al., 2016; Yoshii and Mizushima, 2017). Legionella pneumophila elegantly targets this molecule to inhibit host autophagy (Choy et al., 2012): it secretes a cysteine protease RavZ to cleave a specific peptide bond between phenylalanine and the C-terminal glycine of LC3-PE (Fig. 3B). The C-terminal segment of LC3 precursor is removed to expose the C-terminal glycine by the host cysteine protease ATG4B in the LC3 maturation step; furthermore, ATG4B also cleaves the bond between C-terminal glycine and PE to recycle LC3 in the cells (Maruyama and Noda, 2018). After RavZ has cleaved LC3-PE from the phagophore membrane, the product cannot be reconjugated to PE as it lacks the C-terminal glycine residue (Choy et al., 2012). Therefore, Legionella RavZ competes with host ATG4B, although there is a difference in specificity. The structure of ATG4B in complex with LC3 has been determined and the enzymatic mechanism has been proposed (Satoo et al., 2009). The primary sequence comparison showed that RavZ was quite different in length and, unexpectedly, there were two LIR motifs at the N-terminal region (N-LIR1/2) and one LIR motif at the C-terminal region (C-LIR) in RavZ (Kwon et al., 2017b). Based on the missing electron density map, the regions are very flexible; conversely, they are versatile to seize the LC3-PE molecules on the membrane. In addition to these regions, there are two independent domains, catalytic (CAT) and membrane targeting (MT). The CAT domain shows a similar folding pattern to Ub-like proteases and contains the catalytic triad residues His176-Asp197-Cys258 for the hydrolysis of the peptide bond (Horenkamp et al., 2015; Kwon et al., 2017b). The function of the MT domain is characterized by a higher preference for phosphatidylinositol 3-phosphate, which is likely to be abundant in the autophagosomal membrane (Horenkamp et al., 2015). Based on this structural information, a working model for RavZ has been proposed (Fig. 3C). Both N-LIR1/2 and C-LIR tether the LC3-PE molecules on the membrane and RavZ cuts the third (or one of the tethered) LC3-PE molecule by using its CAT domain. Here, we propose a ‘Tethering and Cut’ model for further explanation. SAXS (small-angle X-ray scattering) data have shown a 1:2 RavZ-(LC3)2 complex model, which supports this model, although the resolution is relatively low (Kwon et al., 2017b). Later, another model, ‘Lift and Cut’, was proposed independently (Pantoom et al., 2017; Yang et al., 2017) (Fig. 3D). This model is based on the conformational change of the hydrophobic α3-helix, which may point towards the membrane, and the structurally similar region in the CAT domain with lipid-binding protein yeast Sec14 homolog (Shf1) (Yang et al., 2017). The α3-helix picks out the LC3-PE from the membrane and the lipid PE moiety is then recognized and cut by RavZ. However, both models are incomplete owing to the absence of the structure of the complex with LC3 bound to the active site of RavZ. Another controversy is the exact role of the two N-LIR1/2 motifs; it is possible that the reported complex structure between RavZ and LC3 might be a crystallization artifact and the only second LIR2 is proposed to be critical (Yang et al., 2017). However, another report showed that deletions, and even point mutations, on any of the LIR motifs resulted in quite significant functional defects in cell-based assays (Kwon et al., 2017b). Furthermore, the structure of the complex between LC3 and a longer peptide comprising tandem N-LIR1/2 showed that the first LIR (LIR1) was a major contributory factor for LC3 binding and the tandem LIR motifs formed a characteristic β-sheet conformation to augment the binding affinity (Kwon et al., 2017a). To fully understand the function of proteins involved in host xenophagy and in the manipulation of host autophagy, the combination of three-dimensional structures with biochemistry and cell biology data is necessary. Novel findings and mechanisms are continuously proposed, which makes the explanation of the structure-function relationships of all molecules challenging. Therefore, we focused on two examples, the NDP52-GAL8 interaction in the host and the RavZ-LC3 interaction in the bacteria Legionella pneumophila. The structural details of the complex between NDP52 and GAL8 have previously been determined (Kim et al., 2013; Li et al., 2013) and explain how the sugar receptor is involved in this autophagy pathway. The autophagy receptor NDP52 is targeted to the phagophore via LC3 interaction. We have generated a plausible model for this event (Fig. 2C); however, the missing link is bacterial ubiquitylation. Most probably, the Ub-coated bacteria are recognized by the UBZ domain of NDP52, but it is still unclear which molecules of the bacterial surface are ubiquitylated by the host E3-ligases, despite the identification of three E3 Ub-ligases (Huett et al., 2012; Manzanillo et al., 2013; Noad et al., 2017). The identification of the ubiquitylation target(s) in bacteria is one of the key research directions to understand xenophagy. As noted, each bacterium utilizes unique molecules to manipulate host autophagy. Legionella pneumophila secrete RavZ, an LC3 deconjugating enzyme, for their survival. Structural information on RavZ has been competitively reported by several research groups, although some controversies remain. Two proposed models for RavZ action in the cells should be further verified biochemically and structurally. However, this is not straightforward because the RavZ works in the vicinity of the membrane and thus, all experimental conditions are required to mimic these environments. The regions containing LIR motifs are very flexible and there are many, which complicates the study of the RavZ-LC3 interaction. To provide greater understanding of the RavZ action, we await the structural information of RavZ in complex with LC3-PE at the active site, which will be helpful to develop therapies against Legionnaires’ disease. Fig. 1. Bacteria invade mammalian cells and the carbohydrates originally exposed to the outside the cells are now towards the inside of the vacuoles (or phagosomes). Bacteria secrete effectors, such as Eis from Mycobacterium tuberculosis, edema factor toxin from Bacillus anthracis, and cholera toxin from Vibrio cholerae, to modulate the induction of the host cell autophagy signaling. Some bacteria escape from the vacuoles and are ubiquitylated by host E3 Ub-ligases, such as LRSAM1, PARKIN, and the LUBAC complex. Most of the bacteria are restricted inside the vacuoles; however, bacterial division ultimately causes the rupture of the phagosomal membrane and, subsequently, the carbohydrates are now exposed to the cytoplasmic space. This acts as a danger signal to the cells and the carbohydrates are recognized by the sugar receptor GAL8, which immediately recruits the autophagy receptor NDP52. This recognition step by the autophagy system is inhibited by bacterial proteins, such as RavZ from Legionella pneumophila, IcsB from Shigella flexneri, and ActA and internalin K (InlK) from Listeria monocytogenes. RavZ cleaves the LC3-PE molecule, leading to the complete inactivation and significant damage to host autophagy. The fusion step between the autophagosome and lysosome for autolysosomes production is also blocked by VacA from Helicobacter pylori and ESAT-6 (early secreted antigenic target of 6 kDa) from Mycobacterium tuberculosis. In practice, each xenophagy step is much more detailed and there are many different pathways involved in different bacteria; these cannot be included in this simplified version. Fig. 2. (A) Domain structure of NDP52 and the interacting proteins, LC3C, GAL8, and Ub. SKICH (skeletal muscle and kidney-enriched inositol phosphatase carboxyl homology), CLIR (non-canonical LC3-interaction region), CC (coiled coil), GALBI (galectin-8 binding), and UBZ (ubiquitin-binding zinc finger) domains are colored light brown, orange, green, yellow, and purple, respectively. The interacting LC3C, GAL8, and Ub are colored sky blue, salmon, and gray, respectively. (B) The structures of each domain complexed with the interacting partner. The color scheme is the same as for panel (A). The atomic resolution structure of the central CC domain of NDP52 is not available, but the homodimer forms parallel to CC were revealed by ACCORD and SAXS experiments (). (C) A schematic model for Salmonella clearance in collaboration between NDP52 and GAL8. The structures and colors for the molecules are the same as panels (A) and (B). The SCV (Salmonella-containing vacuole) is ruptured and the carbohydrates are now exposed to the cytoplasm in mammalian cells. The sugar receptor GAL8 recognizes the carbohydrate by using N-CRD and, simultaneously, the C-CRD of GAL8 binds to the GALBI region of NDP52. The parallel CC dimer of NDP52 is critical for the proper orientation of this bridging molecule. In homodimeric NDP52, both GALBI regions point towards SCV and both LIR motifs orient towards LC3-anchored phagophore with proper spacing defined by the length of CC. Then, the phagophore membrane engulfs the Salmonella to complete the autophagosome. Fig. 3. (A) The domains and overall structure of RavZ. The N- and C-terminal regions containing LIR motifs (N-LIR1/2 colored light brown and C-LIR red) are invisible in electron density map. The catalytic (CAT: residues 49–325) and membrane targeting (MT: residues 326–423) domains are colored blue and orange, respectively. (B) The competition between RavZ and cysteine protease ATG4B for the same substrate, LC3B, although the cleavage sites are different. RavZ cleaves the peptide bond between phenylalanine and glycine, whereas ATG4B cleaves the bond between C-terminal glycine and the lipid, phosphatidylethanolamine (PE). (C) The ‘Tethering and Cut’ model. RavZ is targeted to the phagophore membrane and interacts with the LC3-PE molecules anchored in the membrane. By using N- and C-terminal flexible LIR motifs, RavZ is tethered on the membrane and subsequently cuts the specific peptide bond on the LC3-PE molecule. Currently, it is unclear whether RavZ cleaves one of the tethered LC3 molecules or other nearby LC3 molecules. (D) The ‘Lift and Cut’ model. The targeting of RavZ might be the same as panel (C). The α3-helix (colored pink) of RavZ docks on the membrane and lifts a LC3-PE molecule via conformational change, after which the LC3-PE is cleaved at the active site of the catalytic domain of RavZ. Behrends, C, and Fulda, S (2012). Receptor proteins in selective autophagy. Int J Cell Biol. 2012, 673290. Boyle, KB, and Randow, F (2013). The role of ‘eat-me’ signals and autophagy cargo receptors in innate immunity. Curr Opin Microbiol. 16, 339-348. Celli, J (2012). LRSAM1, an E3 Ubiquitin ligase with a sense for bacteria. Cell Host Microbe. 12, 735-736. Chen, W, Biswas, T, Porter, VR, Tsodikov, OV, and Garneau-Tsodikova, S (2011). Unusual regioversatility of acetyltransferase Eis, a cause of drug resistance in XDR-TB. Proc Natl Acad Sci USA. 108, 9804-9808. Choy, A, Dancourt, J, Mugo, B, O’Connor, TJ, Isberg, RR, Melia, TJ, and Roy, CR (2012). The Legionella effector RavZ inhibits host autophagy through irreversible Atg8 deconjugation. Science. 338, 1072-1076. Davis, J, Wang, J, Tropea, JE, Zhang, D, Dauter, Z, Waugh, DS, and Wlodawer, A (2008). Novel fold of VirA, a type III secretion system effector protein from Shigella flexneri. Protein Sci. 17, 2167-2173. Fan, E, O’Neal, CJ, Mitchell, DD, Robien, MA, Zhang, Z, Pickens, JC, Tan, XJ, Korotkov, K, Roach, C, and Krumm, B (2004). Structural biology and structure-based inhibitor design of cholera toxin and heat-labile enterotoxin. Int J Med Microbiol. 294, 217-223. Farre, JC, and Subramani, S (2016). Mechanistic insights into selective autophagy pathways: lessons from yeast. Nat Rev Mol Cell Biol. 17, 537-552. Gangwer, KA, Mushrush, DJ, Stauff, DL, Spiller, B, McClain, MS, Cover, TL, and Lacy, DB (2007). Crystal structure of the Helicobacter pylori vacuolating toxin p55 domain. Proc Natl Acad Sci USA. 104, 16293-16298. Germane, KL, Ohi, R, Goldberg, MB, and Spiller, BW (2008). Structural and functional studies indicate that Shigella VirA is not a protease and does not directly destabilize microtubules. Biochemistry. 47, 10241-10243. He, H, Dang, Y, Dai, F, Guo, Z, Wu, J, She, X, Pei, Y, Chen, Y, Ling, W, and Wu, C (2003). Post-translational modifications of three members of the human MAP1LC3 family and detection of a novel type of modification for MAP1LC3B. J Biol Chem. 278, 29278-29287. Heckmann, BL, Boada-Romero, E, Cunha, LD, Magne, J, and Green, DR (2017). LC3-Associated Phagocytosis and Inflammation. J Mol Biol. 429, 3561-3576. Holmner, A, Lebens, M, Teneberg, S, Angstrom, J, Okvist, M, and Krengel, U (2004). Novel binding site identified in a hybrid between cholera toxin and heat-labile enterotoxin: 1.9 Å crystal structure reveals the details. Structure. 12, 1655-1667. Hong, SB, Kim, BW, Lee, KE, Kim, SW, Jeon, H, Kim, J, and Song, HK (2011). Insights into noncanonical E1 enzyme activation from the structure of autophagic E1 Atg7 with Atg8. Nat Struct Mol Biol. 18, 1323-1330. Hong, SB, Kim, BW, Kim, JH, and Song, HK (2012). Structure of the autophagic E2 enzyme Atg10. Acta Crystallogr D Biol Crystallogr. 68, 1409-1417. Horenkamp, FA, Kauffman, KJ, Kohler, LJ, Sherwood, RK, Krueger, KP, Shteyn, V, Roy, CR, Melia, TJ, and Reinisch, KM (2015). The Legionella anti-autophagy effector RavZ targets the autophagosome via PI3P- and curvature-sensing motifs. Dev Cell. 34, 569-576. Huang, J, and Klionsky, DJ (2007). Autophagy and human disease. Cell Cycle. 6, 1837-1849. Huang, J, and Brumell, JH (2014). Bacteria-autophagy interplay: a battle for survival. Nat Rev Microbiol. 12, 101-114. Huett, A, Heath, RJ, Begun, J, Sassi, SO, Baxt, LA, Vyas, JM, Goldberg, MB, and Xavier, RJ (2012). The LRR and RING domain protein LRSAM1 is an E3 ligase crucial for ubiquitin-dependent autophagy of intracellular Salmonella Typhimurium. Cell Host Microbe. 12, 778-790. Ji, CH, and Kwon, YT (2017). Crosstalk and Interplay between the Ubiquitin-Proteasome System and Autophagy. Mol Cells. 40, 441-449. Kim, JH, and Song, HK (2015). Swapping of interaction partners with ATG5 for autophagosome maturation. BMB Rep. 48, 129-130. Kim, KH, An, DR, Song, J, Yoon, JY, Kim, HS, Yoon, HJ, Im, HN, Kim, J, Kim do, J, and Lee, SJ (2012). Mycobacterium tuberculosis Eis protein initiates suppression of host immune responses by acetylation of DUSP16/MKP-7. Proc Natl Acad Sci USA. 109, 7729-7734. Kim, BW, Hong, SB, Kim, JH, Kwon, DH, and Song, HK (2013). Structural basis for recognition of autophagic receptor NDP52 by the sugar receptor galectin-8. Nat Commun. 4, 1613. Kim, KH, An, DR, Yoon, HJ, Yang, JK, and Suh, SW (2014). Structure of Mycobacterium smegmatis Eis in complex with paromomycin. Acta Crystallogr F Struct Biol Commun. 70, 1173-1179. Kim, JH, Hong, SB, Lee, JK, Han, S, Roh, KH, Lee, KE, Kim, YK, Choi, EJ, and Song, HK (2015). Insights into autophagosome maturation revealed by the structures of ATG5 with its interacting partners. Autophagy. 11, 75-87. Kim, B-W, Kwon, DH, and Song, HK (2016). Structure biology of selective autophagy receptors. BMB Rep. 49, 73-80. Kim, BW, Jung, YO, Kim, MK, Kwon, DH, Park, SH, Kim, JH, Kuk, YB, Oh, SJ, Kim, L, and Kim, BH (2017). ACCORD: an assessment tool to determine the orientation of homodimeric coiled-coils. Sci Rep. 7, 43318. Klionsky, DJ, and Schulman, BA (2014). Dynamic regulation of macroautophagy by distinctive ubiquitin-like proteins. Nat Struct Mol Biol. 21, 336-345. Kwon, DH, Kim, L, Kim, BW, Kim, JH, Roh, KH, Choi, EJ, and Song, HK (2017a). A novel conformation of the LC3-interacting region motif revealed by the structure of a complex between LC3B and RavZ. Biochem Biophys Res Commun. 490, 1093-1099. Kwon, DH, Kim, S, Jung, YO, Roh, KH, Kim, L, Kim, BW, Hong, SB, Lee, IY, Song, JH, and Lee, WC (2017b). 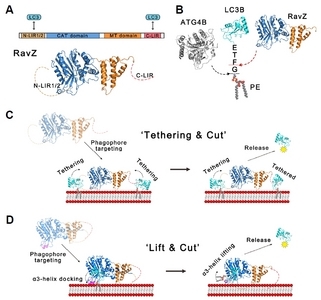 The 1:2 complex between RavZ and LC3 reveals a mechanism for deconjugation of LC3 on the phagophore membrane. Autophagy. 13, 70-81. Levine, B (2005). Eating oneself and uninvited guests: autophagy-related pathways in cellular defense. Cell. 120, 159-162. Levine, B, and Klionsky, DJ (2017). Autophagy wins the 2016 Nobel Prize in Physiology or Medicine: Breakthroughs in baker’s yeast fuel advances in biomedical research. Proc Natl Acad Sci USA. 114, 201-205. Levine, B, Mizushima, N, and Virgin, HW (2011). Autophagy in immunity and inflammation. Nature. 469, 323-335. Li, S, Wandel, MP, Li, F, Liu, Z, He, C, Wu, J, Shi, Y, and Randow, F (2013). Sterical hindrance promotes selectivity of the autophagy cargo receptor NDP52 for the danger receptor galectin-8 in antibacterial autophagy. Sci Signal. 6, ra9. Liu, XM, and Du, LL (2015). A selective autophagy pathway takes an unconventional route. Autophagy. 11, 2381-2382. Liu, L, Sakakibara, K, Chen, Q, and Okamoto, K (2014). Receptor-mediated mitophagy in yeast and mammalian systems. Cell Res. 24, 787-795. Manzanillo, PS, Ayres, JS, Watson, RO, Collins, AC, Souza, G, Rae, CS, Schneider, DS, Nakamura, K, Shiloh, MU, and Cox, JS (2013). The ubiquitin ligase parkin mediates resistance to intracellular pathogens. Nature. 501, 512-516. Maruyama, T, and Noda, NN (2018). Autophagy-regulating protease Atg4: structure, function, regulation and inhibition. J Antibiot (Tokyo). 71, 72-78. Merritt, EA, Sarfaty, S, van den Akker, F, L’Hoir, C, Martial, JA, and Hol, WG (1994). Crystal structure of cholera toxin B-pentamer bound to receptor GM1 pentasaccharide. Protein Sci. 3, 166-175. Mizushima, N (2011). Autophagy in protein and organelle turnover. Cold Spring Harb Symp Quant Biol. 76, 397-402. Mizushima, N, Noda, T, Yoshimori, T, Tanaka, Y, Ishii, T, George, MD, Klionsky, DJ, Ohsumi, M, and Ohsumi, Y (1998). A protein conjugation system essential for autophagy. Nature. 395, 395-398. Nah, J, Yuan, J, and Jung, YK (2015). Autophagy in neurodegenerative diseases: from mechanism to therapeutic approach. Mol Cells. 38, 381-389. Nakatogawa, H, Suzuki, K, Kamada, Y, and Ohsumi, Y (2009). Dynamics and diversity in autophagy mechanisms: lessons from yeast. Nat Rev Mol Cell Biol. 10, 458-467. Neves, D, Job, V, Dortet, L, Cossart, P, and Dessen, A (2013). Structure of internalin InlK from the human pathogen Listeria monocytogenes. J Mol Biol. 425, 4520-4529. Ng, A, and Xavier, RJ (2011). Leucine-rich repeat (LRR) proteins: integrators of pattern recognition and signaling in immunity. Autophagy. 7, 1082-1084. Ng, AC, Eisenberg, JM, Heath, RJ, Huett, A, Robinson, CM, Nau, GJ, and Xavier, RJ (2011). Human leucine-rich repeat proteins: a genome-wide bioinformatic categorization and functional analysis in innate immunity. Proc Natl Acad Sci USA. 108, 4631-4638. Noad, J, von der Malsburg, A, Pathe, C, Michel, MA, Komander, D, and Randow, F (2017). LUBAC-synthesized linear ubiquitin chains restrict cytosol-invading bacteria by activating autophagy and NF-kappaB. Nat Microbiol. 2, 17063. Ogawa, M, Yoshimori, T, Suzuki, T, Sagara, H, Mizushima, N, and Sasakawa, C (2005). Escape of intracellular Shigella from autophagy. Science. 307, 727-731. Pantoom, S, Yang, A, and Wu, YW (2017). Lift and cut: Anti-host autophagy mechanism of Legionella pneumophila. Autophagy. 13, 1467-1469. Perrin, AJ, Jiang, X, Birmingham, CL, So, NS, and Brumell, JH (2004). Recognition of bacteria in the cytosol of Mammalian cells by the ubiquitin system. Curr Biol. 14, 806-811. Rahighi, S, and Dikic, I (2012). Selectivity of the ubiquitin-binding modules. FEBS Lett. 586, 2705-2710. Renshaw, PS, Lightbody, KL, Veverka, V, Muskett, FW, Kelly, G, Frenkiel, TA, Gordon, SV, Hewinson, RG, Burke, B, and Norman, J (2005). Structure and function of the complex formed by the tuberculosis virulence factors CFP-10 and ESAT-6. EMBO J. 24, 2491-2498. Santelli, E, Bankston, LA, Leppla, SH, and Liddington, RC (2004). Crystal structure of a complex between anthrax toxin and its host cell receptor. Nature. 430, 905-908. Satoo, K, Noda, NN, Kumeta, H, Fujioka, Y, Mizushima, N, Ohsumi, Y, and Inagaki, F (2009). The structure of Atg4B-LC3 complex reveals the mechanism of LC3 processing and delipidation during autophagy. EMBO J. 28, 1341-1350. Shen, Y, Guo, Q, Zhukovskaya, NL, Drum, CL, Bohm, A, and Tang, WJ (2004). Structure of anthrax edema factor-calmodulin-adenosine 5′-(alpha,beta-methylene)-triphosphate complex reveals an alternative mode of ATP binding to the catalytic site. Biochem Biophys Res Commun. 317, 309-314. Shin, DM, Jeon, BY, Lee, HM, Jin, HS, Yuk, JM, Song, CH, Lee, SH, Lee, ZW, Cho, SN, and Kim, JM (2010). Mycobacterium tuberculosis eis regulates autophagy, inflammation, and cell death through redox-dependent signaling. PLoS Pathog. 6, e1001230. Sorbara, MT, and Girardin, SE (2015). Emerging themes in bacterial autophagy. Curr Opin Microbiol. 23, 163-170. Svenning, S, and Johansen, T (2013). Selective autophagy. Essays Biochem. 55, 79-92. Tattoli, I, Sorbara, MT, Philpott, DJ, and Girardin, SE (2012). Bacterial autophagy: the trigger, the target and the timing. Autophagy. 8, 1848-1850. Thurston, TL, Ryzhakov, G, Bloor, S, von Muhlinen, N, and Randow, F (2009). The TBK1 adaptor and autophagy receptor NDP52 restricts the proliferation of ubiquitin-coated bacteria. Nat Immunol. 10, 1215-1221. Thurston, TL, Wandel, MP, von Muhlinen, N, Foeglein, A, and Randow, F (2012). Galectin 8 targets damaged vesicles for autophagy to defend cells against bacterial invasion. Nature. 482, 414-418. Wen, X, and Klionsky, DJ (2016). An overview of macroautophagy in yeast. J Mol Biol. 428, 1681-1699. Yang, A, Pantoom, S, and Wu, YW (2017). Elucidation of the anti-autophagy mechanism of the Legionella effector RavZ using semisynthetic LC3 proteins. Elife. 6, e23905. Yoshii, SR, and Mizushima, N (2017). Monitoring and Measuring Autophagy. Int J Mol Sci. 18, 1865. Zaffagnini, G, and Martens, S (2016). Mechanisms of selective autophagy. J Mol Biol. 428, 1714-1724. Zhang, RG, Scott, DL, Westbrook, ML, Nance, S, Spangler, BD, Shipley, GG, and Westbrook, EM (1995). The three-dimensional crystal structure of cholera toxin. J Mol Biol. 251, 563-573.